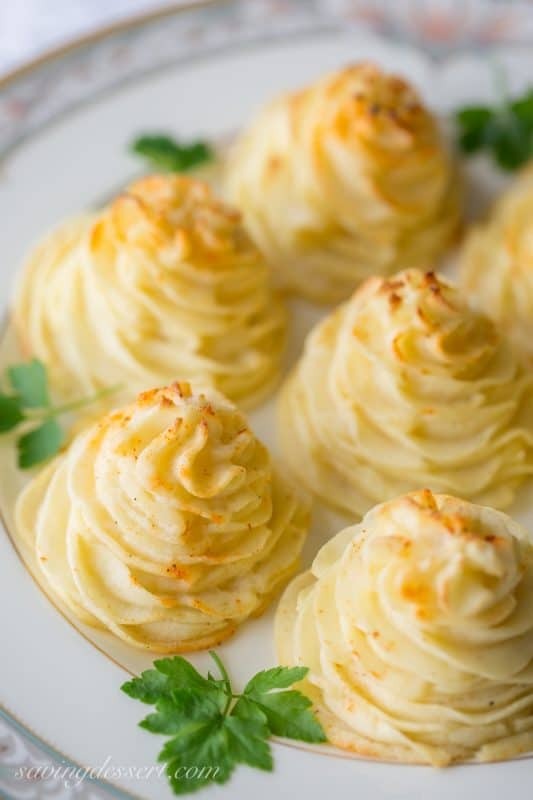 Duchess Potatoes ~ pillowy soft mashed potatoes piped into swirls, drizzled with butter and baked to golden, puffy perfection. So easy and pretty too! Many years ago, when we lived in Tennessee, we often entertained and had little dinner parties on our porch with candles, wine, good friends and sparkly lights. These lovely little spuds were often on the menu because they are so easy to make, and such fun to serve. Everybody will think you went to a lot of trouble because the name Duchess Potatoes sounds so sophisticated. Actually if you can use a piping bag and tip, and mash a potato, you can do this. Can’t you see these on your Thanksgiving table? I love the light crust on the outside and the pillowy soft middle. You can even make these ahead of time and pop them in the oven at the last minute. You know you’re going to mash potatoes anyway so this is just one more simple step. Be sure to show restraint when adding milk and butter. They may look creamy when you pipe them on the baking sheet, but they’ll spread into a blob if the mixture is too thin, trust me. So err on the drier side and you’ll be fine. I like to spice them up a bit with a dash of cayenne or smoked paprika then bake in a hot oven for 15 minutes and serve on pretty dishes for a lovely presentation. 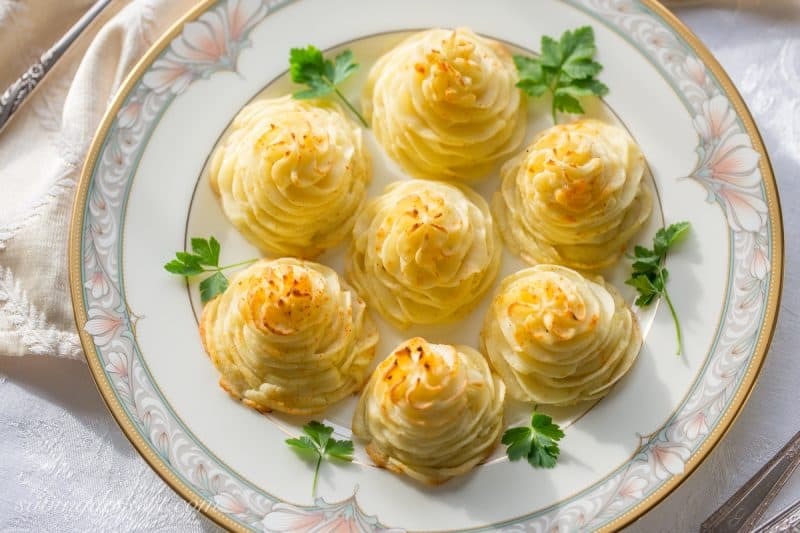 Pillowy soft potatoes piped into rosettes then baked until the bottom is crispy and the the edges are lightly browned. Place the peeled potatoes in a large soup pot and cover with water. Heat on high and cook in boiling water for about 15 minutes, or until fork tender. Drain the potatoes really well the add back to the pot. Mash the potatoes by hand until smooth. In a small measuring cup, microwave the milk and 3 tablespoons butter for about 1 minute. Add the milk to the mashed potatoes along with the salt and pepper and cayenne if using. Continue to mash until well blended and smooth. Allow the potatoes to cool about 10 minutes then add the egg yolks. Scoop the mixture into a piping bag fitted with a large star tip. Pipe rosettes about 2 inches in diameter on a parchment lined baking sheet. Drizzle with melted butter and sprinkle with paprika or a little cayenne if using. Bake for 15 minutes or until lightly browned around the edges. Allow the potatoes to rest on the pan for a few minutes then serve. The inside will be very hot and fluffy. 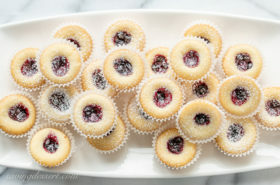 Make ahead by piping rosettes on a parchment lined baking sheet, then gently cover and chill until ready to bake. Allow the potatoes to rest at room temperature about 30 minutes before baking. Don't add too much milk or butter, soft potatoes will spread. Resist the urge to make them too tall, they tend to fall over and/or compress into a blob. For light and fluffy potatoes be sure to drain the potatoes and mash by hand, do not use a mixer as your potatoes will be gummy. 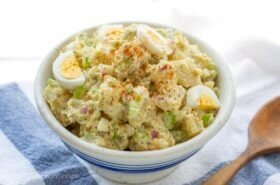 Here are a few more delicious sides dishes perfect for entertaining! I’m off to find a turkey! Thanks so much for stopping by. Have a lovely weekend! THe rotators are impossible to pipe unless they are perfectly smooth. I use a potato rice to achieve the smoothness necessary topipe them. These are beautiful! I can see that they would be a show stopper when served at a special meal. I think I will make a practice run! 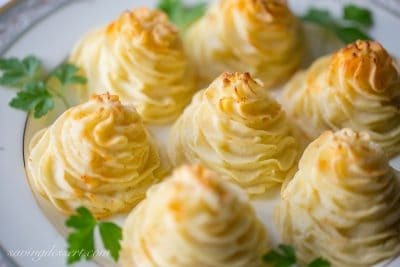 They are fun and easy to make Kate – can’t be a good potato dish! How did we miss these little spuds? Oh My , they look so darn pretty- I want to eat a few right now! Aww thanks Anna! Happy Thanksgiving! What a beautiful presentation. Tricia! We are having a smaller Thanksgiving gathering this year and these potatoes would be just perfect. These are gorgeous – and you’re right, I always assumed they were a lot of work. I’ll try them at my next family get-together! No trouble at all Beth – thanks so much and happy Thanksgiving! Hi Tricia, these are indeed so sophisticated, you can make any food look and taste amazing, these are very special! You are so sweet Cheri! Thank so much – hope you have a wonderful Thanksgiving. Love that you have been revisiting some classic recipes. I haven’t had these for years, and it was a nice reminder, and perfect timing for the holidays. Thanks! Thank you Terry! Hope you have a lovely Thanksgiving. These are absolutely beautiful! Perfect for any dinner party. You too Mandy! Thanks so much for stopping by! So pretty and yum! I made those potatoes years ago and loved them. Now you have me crave for some! Thanks Angie – hope you get to make them soon! 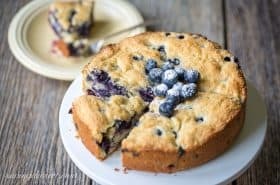 This is a recipe I’ve been looking for. We have a similar recipe in Germany, you deep fry the mashed potatoes. I like your version better. Happy Thanksgiving. Hey Gerlinde – my Mom made mashed potato patties with a little onion and formed them into patties. She dredged them in flour, then egg, then flour again and fried them in a skillet. Love those! Thank you Becky – Happy Thanksgiving! Many years ago I loved to entertain..and many many yrs ago I took a little cooking class.. because I had no clue..of anything..so I think I had both daughters and was ..24..and took this class at a high school..
..the cooking teacher was French from France..and taught us these..
Back in the days when our children were young and we had fun – I remember! I would have loved that cooking class – how fun! This sure dies fancy up mashed potatoes. We had larger ones at a restaurant and they looked and tasted very good just as I’m sure yours did. Thanks Larry – I have never had them in a restaurant – but I think I would love them there too. I need to get out more! What a great idea – going to give them a test-drive tonight! Have you tried freezing them? Just wondering if I could make them a couple of days ahead and freeze…probably before baking. Since the potatoes are already cooked, you may be able to freeze them but I think refrigeration for a few hours is probably the best idea if possible. Thanks for stopping by Lorinda! Thanks Jennifer – come on down and you can eat with us! Bring that lovely leek and mushroom gratin too! Tricia, that is one gorgeous plate of potatoes! 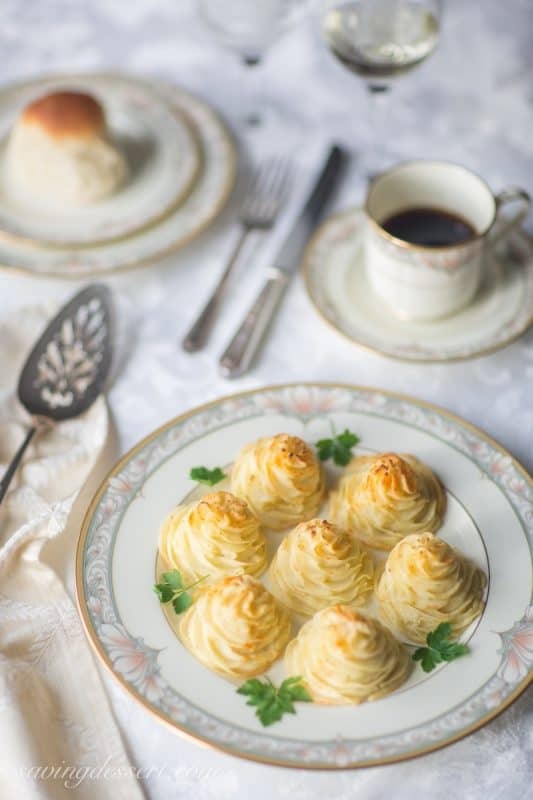 You really managed to make humble potatoes classy and elegant – it’s really beautiful. I am very tempted to try this but I’m definitely worried about mine turning out squat and spreading. I tend to pipe things too large, all the time! I was about to ask if you use an open or closed star tip but read you used the Wilton 1M. I have that! Thanks for the inspiration! 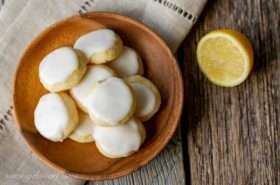 They are so easy Monica – I hope you love them as much as we do – yummy! Almost too pretty to eat. They glow. Thanks Amalia – they are pretty good to eat too! Thanks Betty – hope you enjoy a little time off and have a wonderful Thanksgiving! Hey Sue – come on over we’ll save you a seat! I used a large Wilton No. 1M tip and I’m pretty sure I bent the tips in just a bit to get them closer together. Thanks so much for your kind words 🙂 Happy Thanksgiving! Tricia, these are just too pretty for words! I love mashed potatoes but this makes them so special. I especially love that they can be made ahead. 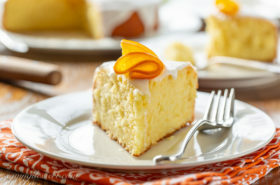 Pinning, I know I will need this recipe!